Annapolis, MD Exit 19: Are you a chocoholic in need of a fix? You won’t want to miss the 4th Annual Chocolate Binge Festival where Chocolate lovers come together to enjoy a day to celebrate the art of chocolate. 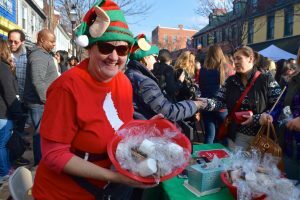 Start off the December holiday season with some fun and indulge your sweet tooth at the annual Annapolis Chocolate Binge Festival, to benefit the Annapolis Arts District and We Care and Friends. Meander along West Street whereover 35 local vendors will be selling chocolate specialties, including chocolate caramels, cakes, bars, chocolate truffles, fudge, cookies, candies, fondue, chocolate fountain, French macaroons, candy apples, chocolate sushi, and even chocolate martinis. Chocoholics, get ready to binge! 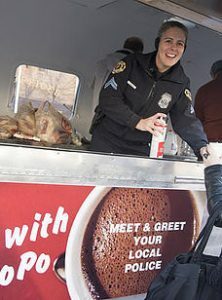 Enjoy live music, roast marshmallows and make S’mores at the firepit with the Fire Department, a gingerbread house moon bounce, Cocoa with the PoPo, Balloon Sculptures, Face Painting, McGruff the crime fighting dog, and Sparky the fire department dog, Comedy, Ugly Sweater Contest, chocolate massages, wine tasting, a holiday market, the lighting of the Holiday Light Canopy, along with a visit from Santa. Then get your camera ready at 5pm for the countdown of the Lighting of the Holiday Light Canopy over West Street in the Annapolis Arts District. 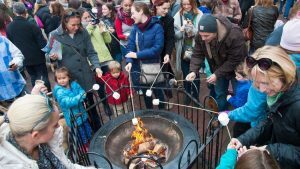 Chocolate, holiday vendors, music, family friendly entertainment and holiday light canopy makes for a great street party in Annapolis. Support the local arts and and We Care and Friends . Suggested $5 donation to the Annapolis Arts District-(kids under 12 are free with parents). This entry was posted in Articulture, Arts and Crafts, Drink, Entertainment, exhibition, Festival, Food, Fun, Kids, Maryland, Nature, Shopping, Special Event, Walking Tour and tagged Annapolis, Annapolis Arts District, art, artist, bars, binge, cake, candy, candy apple, caramel, chocoholic, chocolate, Chocolate Binge Festival, chocolate fountain, cookie, December, drink, entertainment, festival, fondue, Food, fudge, fun, holiday, live music, local, macaroon, martini, Maryland, music, season, Shopping, sushi, sweet tooth, truffle, vendor. Bookmark the permalink.